STANDISH-Windham Varsity Baseball improved to 3-4 on the season in a 2-1 victory over the Bonny Eagle Scots under the lights at St. Joseph’s College. Tanner Bernier helped secure the victory for Windham, pitching the full seven innings and striking out six batters. 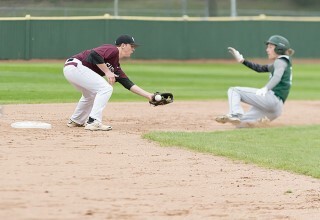 Both teams were in shut out mode until the bottom of the fourth inning. Bonny Eagle’s pitcher, Colby Lambert, had pitched a perfect game up to that point. Cam McCartney and Bryce Afthim reached base on back-to-back singles. With two outs, Tim Greenlaw hit a single that drove in Cam McCartney. On the next play, a fielding error allowed Bryce Afthim to add another run. Scots pitcher Lambert seemed unfazed by the Eagle offense. He baffled Windham batters in the fifth and six innings with curve balls. Bernier and his team continued solid defense until the top of the seventh. The Scots managed to get two runners on with singles. With one out, Bernier took matters into his own hands and caught a foul ball at the backstop. The Scots’ runners advanced to second and third. Bernier hit Colby Lambert with a pitch to load the bases. The first pitch to Cody Mains was wild and Greg Emerson scampered home to get Bonny Eagle on the board. With nerves on edge, Bernier dealt a pitch that Mains drove high into the sky, but Windham’s Kobe Lauzier cleanly caught the final out to give Windham the victory.